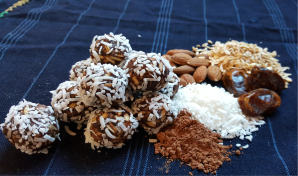 These chocolatey treats contain no refined sugars, and are loaded with protein and fiber for a quick snack that really packs a punch! Simmer the dates and chia seeds in 1/2 cup water until the dates are soft, then puree them with a fork. Add the peanut butter, honey (if using), cocoa, Naked Oats, ground almonds and hemp hearts and combine. 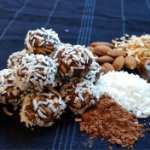 Allow the mixture to cool slightly, then form into balls, and roll the balls in coconut. Keep in the fridge...or just eat them on the spot!